It was a nice break from my usual Mason State Bank race, which has a rather difficult uphill finish of 3-4 blocks.I was in much better condition for this race, having lost a bit of weight and had followed a good program of exercise since the other race. I was hoping for a big improvement in my time and was reasonably satisfied. It went against my nature to rise at 7pm for the 8am start time. The other race is in the evening. The number of participants was considerably lower but it was well conducted and a lot of fun. Note that the logo for the race shows a saint running along with a giant pancake character. They carry through on the pancake theme with a pancake breakfast for the participants. The race starts in front of the church on S. Lansing St. The race is conducted on city streets, the Hayhoe Riverwalk trail and through the Maple Grove Cemetery. You can see the participants gathering at the start line in the photos above and the race getting underway below. Also below you can see my self portrait, "before" and "after" the race shots. You can see how jovial the group was at this race with dancing at the finish line. You can also see one dancer dressed as a pancake. Fun for all! 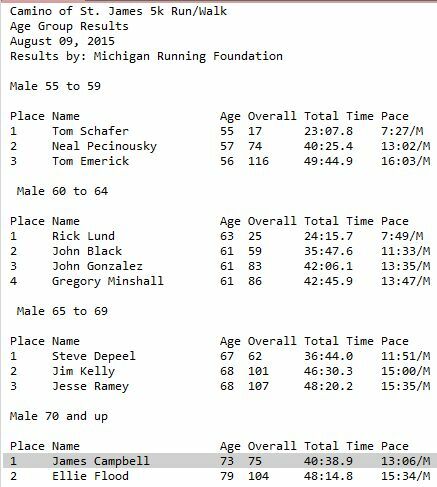 Below are the finish times for the oldest four men's groups, since my group consisted of only two participants. I was interested to see how my time compared to others in my age group. Though my official time was 40:38.9, I listed my "corrected" time as 41:34 based on my GPS calculation my distance traveled as 4.89 k. If I maintained my average speed for the full 5 k my time would have been 41:34.